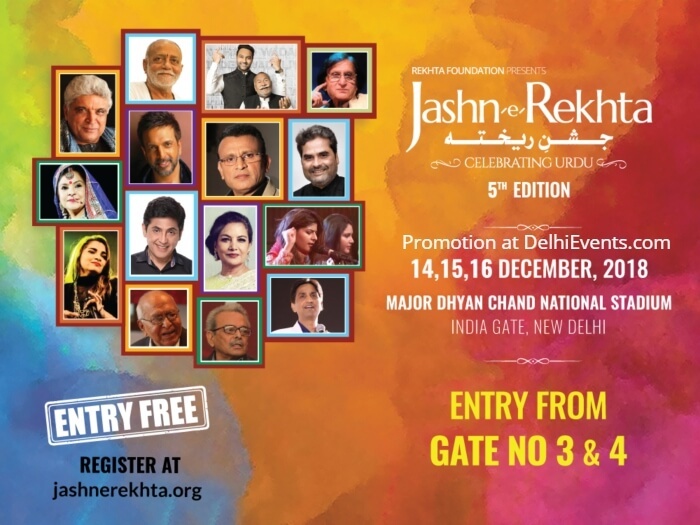 Event Description : The festival celebrating the timeless beauty and eloquence of Urdu - Jashn-e-Rekhta - is back with its much awaited 5th edition from 14th to 16th of December at Major Dhyan Chand National Stadium, New Delhi. It has received overwhelming success in the last four years and has drawn over one lakh visitors. A number of well-known personalities including distinguished poets, authors and artists from across the globe have been a part of the festival. Organized by the Rekhta Foundation, the three-day long celebration aspires to unite Urdu lovers from every part of the world to celebrate this unique language, its rich history and culture. It also endeavours to engage, enlighten and entertain audiences from diverse backgrounds. Jashn-e-Rekhta 2018 will begin on the evening of Dec 14th (Day 1) with the inauguration and an address by the inimitable Morari Bapu, who is not only an exponent of Ram Charit Manas but is also a great lover of Urdu Poetry. In the next two days, a discussion track with Javed Akhtar and Shabana Azmi on their respective fathers, Jan Nisar Akhtar and Kaifi Azmi will bring to the fore their life and works. In another track, cinema lovers will get a chance to interact with Vishal Bhardwaj as he talks about his love for Urdu poetry and its influence in his cinematic work. Vishal will also recite Urdu poetry penned by him. Celebrated actor and anchor, Annu Kapoor, through a musical tribute, will uncover the poetical genius of Majrooh Sultanpuri in honour of the centenary of his birth. The versatile Malini Awasthi will regale the audience with the rendition of lively Awadhi folk songs. To add to the spirit of the festivities, the grand Mushaira at Jashn-e-Rekhta will witness some of the biggest names among contemporary Urdu poets such as Wasim Barelvi, Farhat Ehsas and others. In another conversational track, popular poet Kumar Vishwas will delve into the lives of some ‘infamous’ poets in a track - ‘Wo Shayar Badnaam’. Aasif Sheikh, the renowned film and television actor who is also known for his comic roles especially in ‘Bhabhiji Ghar Par Hain’, along with the writer of the show - Manoj Santoshi, will make the audience burst into a dose of laughter in their session ‘Bhabhiji Urdu Boliye’. In another candid session, popular actor and comedian Jaaved Jaaferi will ‘Romance with Urdu’ and perform a comic act around current Bollywood songs versus yesteryear’s songs. In a special Urdu experimental genre, famous Bollywood singer Shruti Pathak, known for songs such as Mar Jaawan (Fashion) and Tujhe Bhula Diya (Anjaana Anjaani) will perform a unique rendition of some Ghazals in ‘Guzzler’. In another performance, Kanishk Seth, a young singing talent, who is also the son of renowned singer Kavita Seth, will render qalams of Khusro with fusion of electronic music in a performance called ‘Trance With Khusrow’. Renowned Malayalam singer and a Carnatic vocalist, Gayathri Asokan, will explore another genre with the rendition of some beautiful ghazals. Dastangoi exponents, Mahmood Farooqui along with Darain Shahidi will present Dastan-e-Kana Bati, based on the works of the last dastango of Delhi, Mir Baqar Ali. They will also pay a tribute to the late Mushtaq Ahmed Yusufi, famed Urdu humorist. The lovers of Qawwali will be in for a treat as the Warsi Brothers from Hyderabad will perform traditional qawwalis at the festival. Ustad Iqbal Ahmed Khan of the Delhi gharana will add to the atmosphere of music with soulful classical renditions based on the works of the great Amir Khusro. This year, another highlight that is unique and adds to the distinctiveness of Jashn-e-Rekhta is the Women Poets’ Mushaira. The audience will also get to witness a unique and spectacular Ramlila performance in Urdu by the Shri Shraddha Ramlila group titled ‘Ram Kahaani Urdu Wali’. Eminent scholars, Shamsur Rahman Faruqi and Mahmood Farooqui, will discuss the literary brilliance of Intizar Hussain in a panel discussion on ‘The World of Intizar Hussain: Partition, Nostalgia and Mythology in Urdu Literary Culture.’ Another session on Kabir will be led by the renowned writer and novelist Purushottam Agarwal. The renowned Urdu Professor Gopi Chand Narang will discuss ‘Faiz Ke Teen Ishq’,. Keeping up with the tradition of providing an opportunity to showcase unique art forms, the festival will host a martial folk music performance, known traditionally as Chahaar Bait, by Attan Khan and his group. A talented young singer, Kabuki Khanna, will perform Indian opera fusion and Qissagoi by Syed Sahil Agha will masterfully reveal forgotten tales at the festival, which are sure to take the audience to a bygone era. Several open forum spaces and interactive sessions will encourage the audience to participate in the Ghazal Saraai competition and also share their poetry and stories with a wider gathering. The festival will also witness a number of upcoming writers and poets from the literary and cultural cosmos of Urdu. The draw of the Rekhta Bazaar remains unchallenged since 2014, so the festival is back with the fragrance of itr, the antiquities of old Delhi, handicrafts, the delicate beauty of chikankari and Kashmiri embroidery along with an elaborate exhibition of Urdu, Hindi and English books.